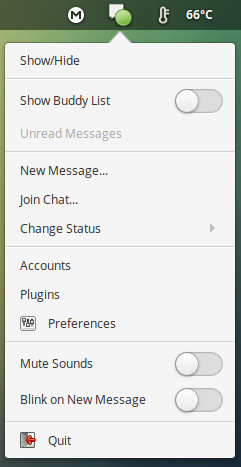 I am not able to see the notification in the notification area for Pidgin chat. Not sure why. When all Pidgin windows are closed it stays open I think but I am not always sure. I used Kadu and it worked in the notification area, but I stopped using it because it kept crashing. It's not a huge deal, but I have to keep the roster window open all the time... Thanks! We can install Pidgin Indicator plugin in Loki. PPA installation instructions are provided at the linked address, but we can avoid the PPA by downloading the deb file from here. 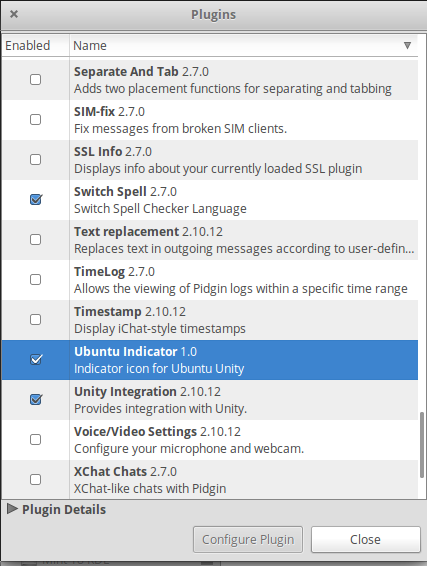 Once installed, open Pidgin and Tools > Plugins, then scroll down to "Ubuntu Indicator" and enable it. Not the answer you're looking for? Browse other questions tagged release-loki wingpanel applications notifications or ask your own question. Why are some apps dark and some apps light?